“Jomsomai bazaar maa 12 baje hawa sarara”, a famous song from the Pokahreli Band Nepathya, describes the main market place in Jomsom (2700m) – the district headquarters of Mustang. Jomsom indeed is a place to be in the mornings until noon. The street vendors are all out in the center of the city, selling their best products. Fruits and vegetables (among them the famous Mustangi apples), the classic Marpha (apple brandy), hand-made handicrafts and hundreds of other what-nots are carefully placed on the stalls, glittering on the gentle sun and fresh breeze, and waiting to be bought. Yak hearders are leading their furry animals through the main street and out of the town for food, their bells producing a melodious Himalayan symphony. As headquarters of the district and a fairly visited place, Jomsom has everything – an airport, a hospital, excellent hotels (both more luxurious and budget options), restaurants serving delicious food for all tastes and last but not least spectacular views of Mount Nilgiri, for which you have a feeling that it is just above the town. Jomsom is also a starting point for many trekking trails, among which the one to the ancient village of Kagbeni and Muktinath. Mustang is a fascinating area with a landscape very similar to the one of Tibet, one of a highaltitude desert. However, unlike in Tibet where travelers have to go through a lot of restrictions and travel only in tourist groups, individual travelers are welcomed in Mustang. Mustang has remained an autonomous kingdom even after the fall of the monarchy in Nepal, partly thanks to its seclusion from the rest of the country. This relative isolation has enabled for the area to retain and nurture its distinctive Thakali culture and traditions. 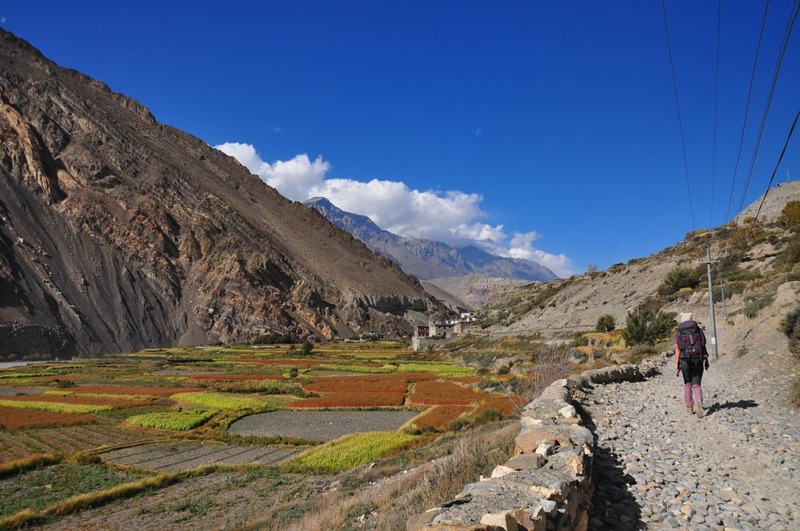 Kagbeni (2840m) is a village roughly 10 kilometers away from Jomsom, or a 2-3 hours walk. 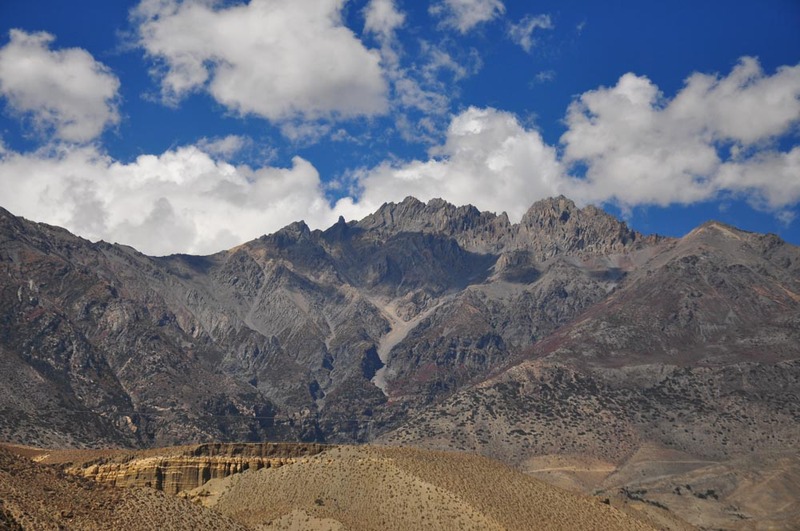 The walk to Kagbeni is very straightforward, following the Kaligandaki river gorge – the deepest in the world of its kind and a reason behind eerie rocky formations that can be found all around Mustang. With its narrow cobbled alley and small Buddhist monasteries scattered all around the village, Kagbeni is a true gem. 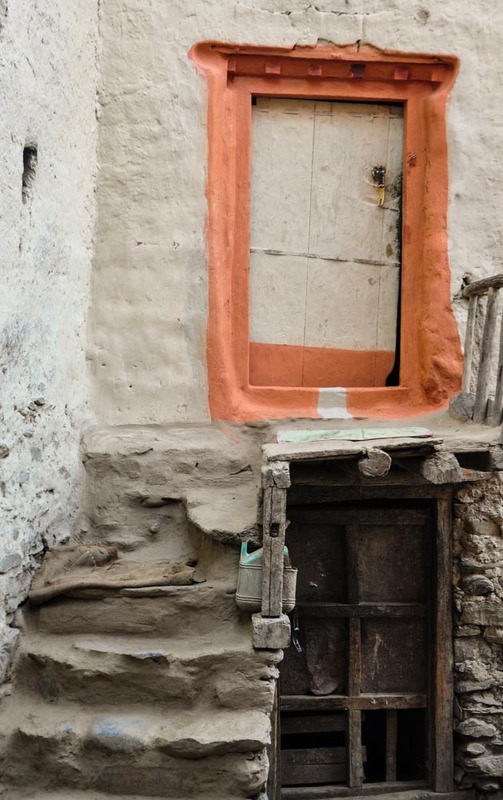 The stone houses carefully decorated with colorful wooden window frames and doors will charm you in no time. On the northern exit of the village there is a small check point office where foreign visitors need to present their special trekking permit for Upper Mustang, since the northern road from there leads to the capital of the kingdom of Mustang – Lo Manthang. From Kagbeni, we took another route and headed towards Muktinath (3710), which is some 4-5 hours away if you walk. Alternatively, you can take a bus or a jeep that will take you right before the steps that lead towards the temple in less than an hour. After hours walking in what looks like to be a desert on quite a high altitude, Muktinath comes in the picture suddenly and with a surprise – It is located in the middle of an oasis filled with lush green forest. Muktinath is considered to be one of the holiest Hindu and Buddhist temples in the world and it lies in the foothills of the Thorong La pass (5416m). It contains a small golden statue of Lord Vishnu alongside an array of other statues of various gods and goddesses. Perhaps one of the most interesting things about Muktinath is the 108 water taps carrying chilled water from the Kaligandaki river lined up in its courtyard. Pious and adventurous visitors take a bath in all 108 of them, following a belief that they would wash away all your sins and bring peace and happiness to your life. Combining three very important elements that make for a great trekking trip – spectacular scenery, a new culture and a spiritual abode, Lower Mustang is a definite must for travelers who want to dive in the strange and the unknown. 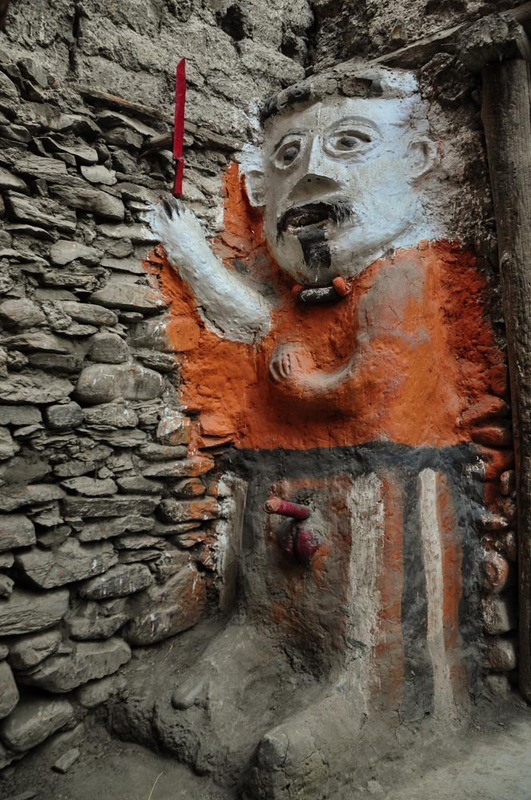 Apart from the above mentioned list of fascinating things about Lower Mustang, one of the highlights of the trek is that the area lies in the monsoon shadow, which means that travelers can visit it even during the monsoon season (no leeches, yay!). Another definite highlight is the delicious Thakkali food that you get everywhere on the trek (with a slightly pumped up price though). Among the things to note is definitely the windy weather that calls for some warm clothes even in the summer (the nights tend to be chilly) and a mask, since the wind combined with the rocky and dry environment, creates a lot of dust. If you indeed decide to embark on this beautiful journey, I am sure that you will find yourself with your eyes shiny from the Marpha brandy, a stomach happily full of yak steak and a Thakkali set, a camera loaded with amazing photographs and a heart filled with unforgettable memories. Marija is a graduate of Social and Cultural Anthropology from the University of Vienna. Having lived a big part of her life abroad, she has developed a great interest in different cultures. Her passion brought her to Nepal for the third time, where she currently lives and does research.